Vision Systems | Retina Systems | Inc. Whether vision or laser, Retina provides the solution. Retina’s turnkey inspection systems are state of the art and designed to provide high value quality assurance and process control. Retina is now able to obtain images, store data, and control the operating system via the Internet real-time, ANYWHERE in the world. Retina has the industry’s only statistically certified inspection solution advanced vision technology for 100% inspection, including sorting, gauging, attribute verification, surface flaw analysis and crack detection. Retina vision systems are state-of-the-art turnkey inspection systems designed to provide high value quality assurance and process control. 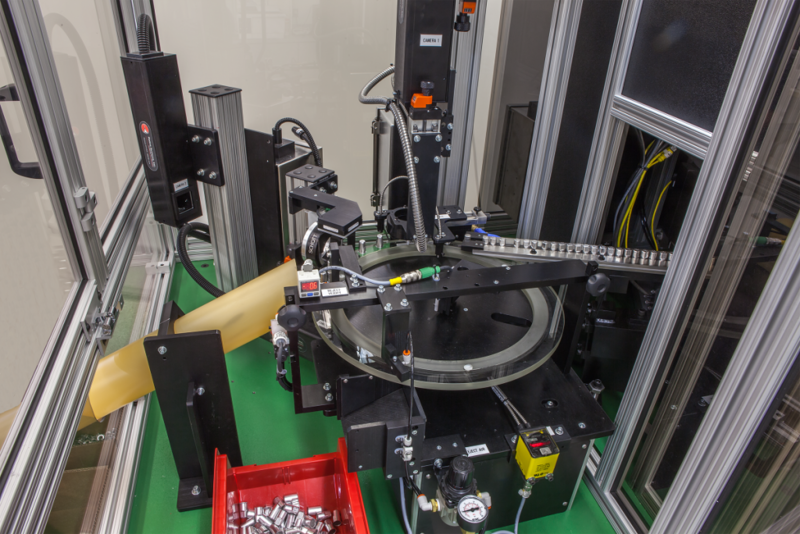 Designed for the fastener industry, they are the ideal solution for high resolution, 100% part inspection of in-process sorting and gauging operations at production speeds of 60 to 600 parts per minute and are capable of inspecting and sorting parts from ½” to 8″. Retina vision systems are capable of simultaneously making multiple attribute inspections and surface flaw analysis of each field of view as well as real-time image enhancements. Retina vision systems have broad application and are widely used to inspect multiple attribute verification, thread sorting, crack/void detection, color sorting, surface finish detection and more. Image acquisition is accomplished using the latest generation vision engines including single and multiple matrix cameras, line scan, color and ultra high-resolution megapixel camera packages. Parts and assemblies are guided through the inspection location with specialized Retina material handling technology. Designed to meet customer application requirements, Retina material handling systems maintain production speeds (60 to 600 parts per minute) while controlling and stabilizing inspected parts. Retina vision systems provide exact dimensional attributes with outputs for use with SQC and SPC charting and control. Retina vision systems provide machine operators the ability to view processed images and inspection data simultaneously. Part changeover is a matter of either selecting the part number on the screen or scanning the appropriate barcode if a barcode scanner is integrated with the vision system. New parts can be added by selecting the load feature and placing a known part in the camera’s view. For over 30 years, Retina Systems personnel have provided non-contact, automated turnkey inspection systems, packaging systems, application expertise, service and support. Our patented laser and vision inspection systems provide 100% quality assurance for customers worldwide. A Retina automated conveyor system can be integrated with any Retina turnkey inspection system. We offer six different packaging features that are tailored to meet your requests. “No-stop” and bagger integrator features can be added to one of our four different conveyor styles for additional customization and automation should you request it. You can learn more about our packaging options and see how each one is integrated with a Retina inspection system here.